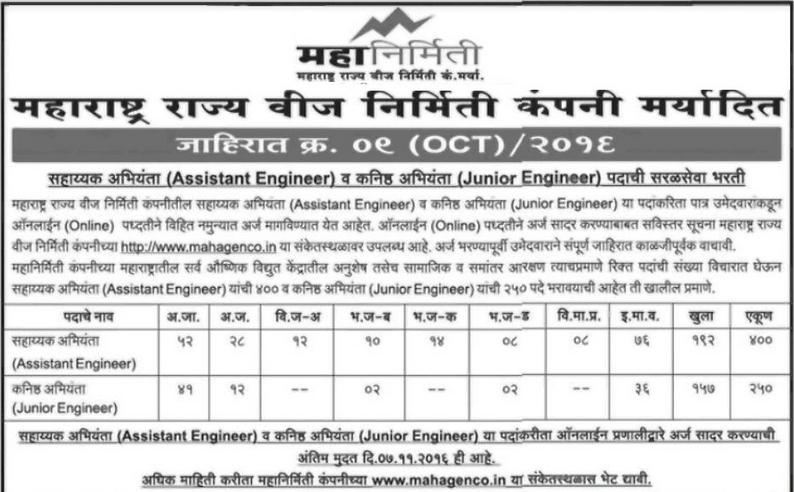 Maharashtra State Power Generation Company Limited (MAHAGENCO), Government of Maharashtra is going to recruit for the post of Assistant Engineer and Junior Engineer.The candidate may apply till 07th November 2016. 1. Assistant Engineer - B.E. / B.Tech Engineering Graduate in Concerned Discipline. Eligible Interested Candidates are required to Apply Online through MAHAGENCO Website on or before 07/11/2016. Further detailed information check out official website.